It's a mad world, but the enigmatic Cheshire Cat is here to welcome you in with this Personality Pose. Designed by Jim Shore, the shape shifter grins as he languidly lounges in his tree. 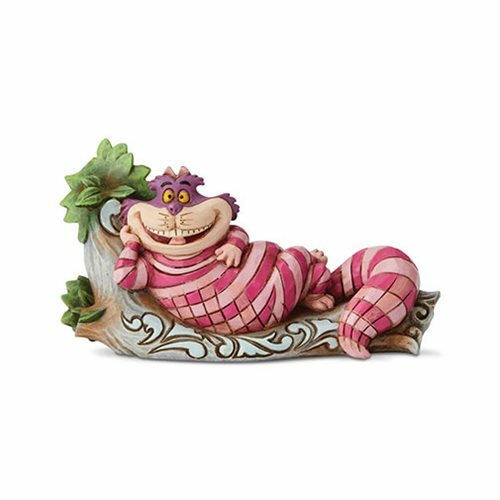 Be sure to add the Disney Traditions Alice In Wonderland Cheshire Cat on Tree The Cat's Meow Statue by Jim Shore to your collection before he disappears! This stone resin statue is a must have for fans of Walt Disney's classic Alice In Wonderland film. Measures about 5 1/10-inches long x 2 3/4-inches tall x 1 1/2-inches wide.